Verified would like to congratulate the winners of the 2011 Circle of Excellence award. The Circle is awarded to only those publications that have, upon rigorous independent review, been able to certify, document and demonstrate that they consistently meet the highest standards of audit excellence. Congratulation to winners and keep up the good work! Circle winners are entitled to refer to and publicly display the Circle of Excellence in the publication, media kit and other promotional materials along with the Verified trademark. 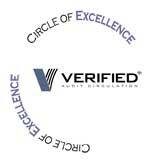 Please contact your Account Coordinator to receive your Circle of Excellence graphics or call Verified at 415-461-6006. Verified Audit Circulation provides auditing, research, reader surveys and confirmation of the delivery and receipt of advertising messages. For a no obligation custom proposal to meet your needs contact salesinfo@verifiedaudit.com or call 800 775 3332.